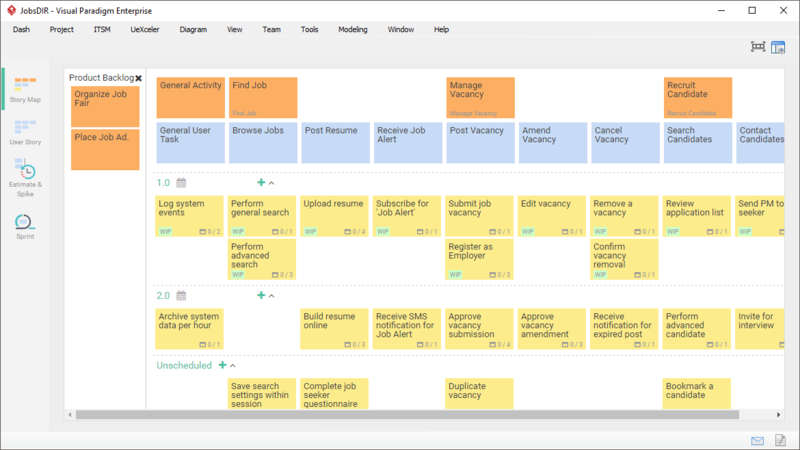 Groom each of the user activities in the product backlog to related user tasks and subsequently into epics using a Story Map. 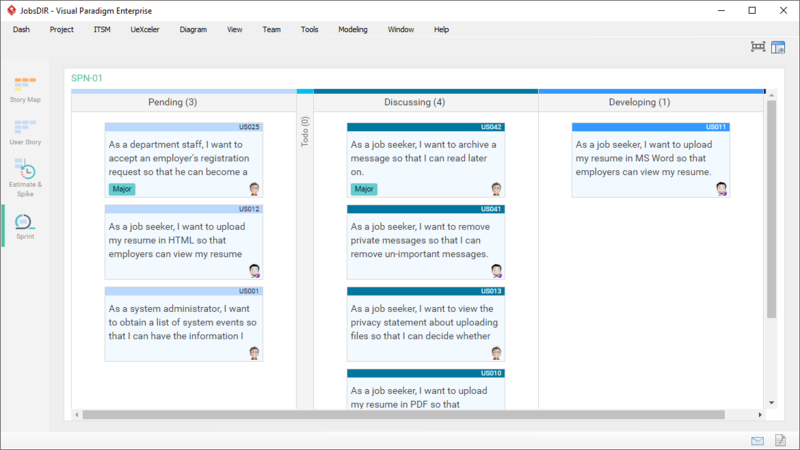 Refine an epic into a list of user stories using user story template in a complex drill-down view. 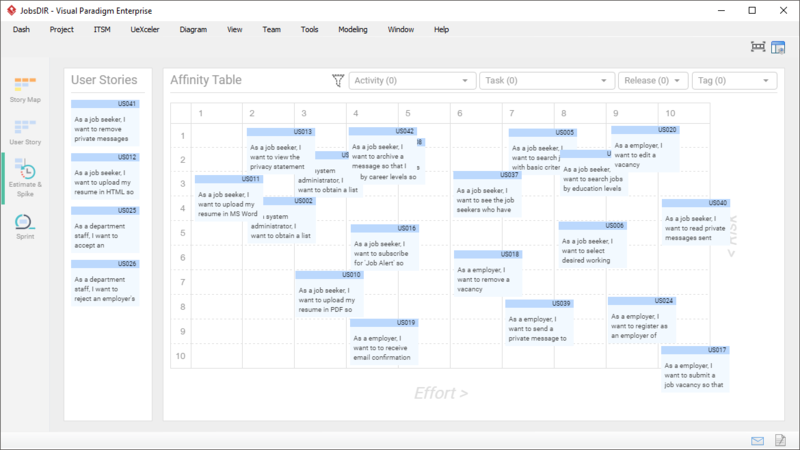 Estimate user stories with Affinity table. 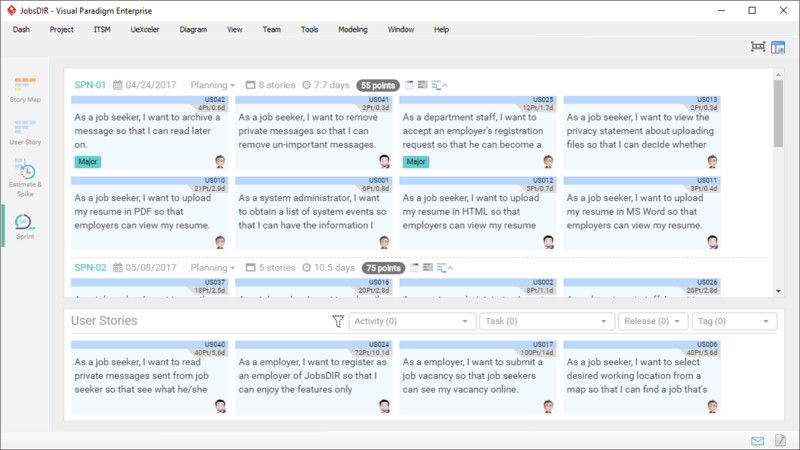 Seamlessly integrate the Story Map, Affinity Table, multiple working sprints, Sprint Task board and Task Manager for automating and streamlining the entire scrum workflow. Break-down complex software features into manageable user activities, user tasks and epics and subsequently to user stories. Oversee the user stories of the entire product in the User Story screen. Create, prioritize and re-locate user stories on-the-fly. Estimate user stories based on their risks and the effort require to achieve them. 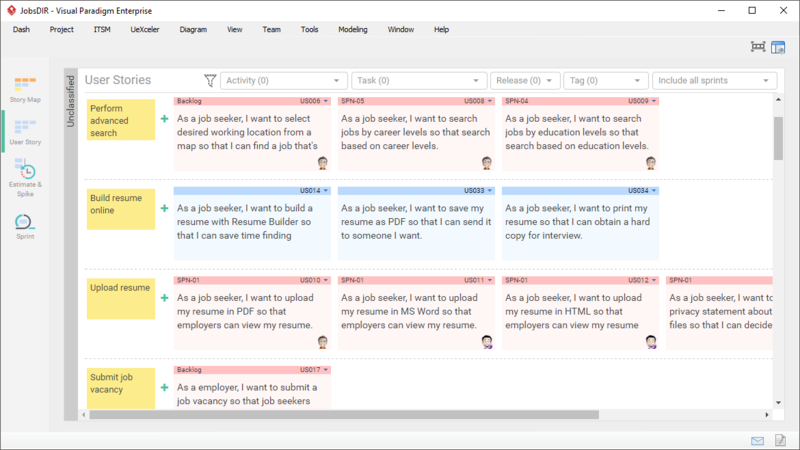 Edit, prioritize, label user stories with easy drag & drop GUI. Manage and organize stories with multiple sprints and epics. 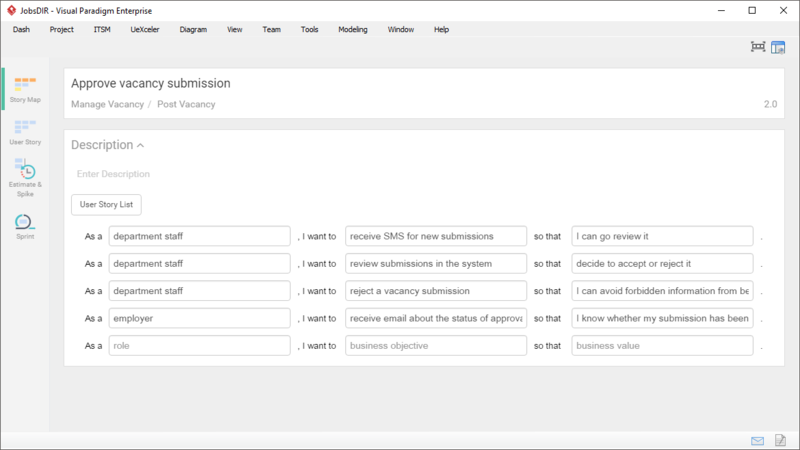 View and update the progress of user stories by drag-and-drop around the columns. A list of simple description of a feature told from the perspective of user. Automatically generate user stories from them. Use of whiteboard as Sprint Task board is time-consuming in updating stories and will easily grow to an unmanageable size, causing inconsistency among information. Not possible for remote teams to maintain the same Task Board. Whiteboard doesn't allow one set of cards to be visualized in different views for stakeholder with different roles of responsibility. Agile software often consists of a set of isolated tools that are not well integrated and very hard to use and maintain. Well integrated with Enterprise Architecture (EA) and Project Management Guide-Through processes. User features identified in EA or Project Management Processes can send straight to the product backlog for grooming. Breakdown complex user features into user tasks, epics and user stories in a flexible and manageable hierarchical structure instead of a flat sprint structure. Fully automating the scrum process for team collaboration with Story Map (Complex to Manageable), Affinity Table (Story and complexity estimation), Multiple Working Sprints (Scrum of Scrum), Sprint Tasks board (Task Progress Visualization), Task Manager (automated task and workflow management). Believe Us! You Will Love Visual Paradigm's Solutions -- But You Be the Judge.